I love ribbon. I’ve collected lovely ribbons for years now. And I have quite the stash. 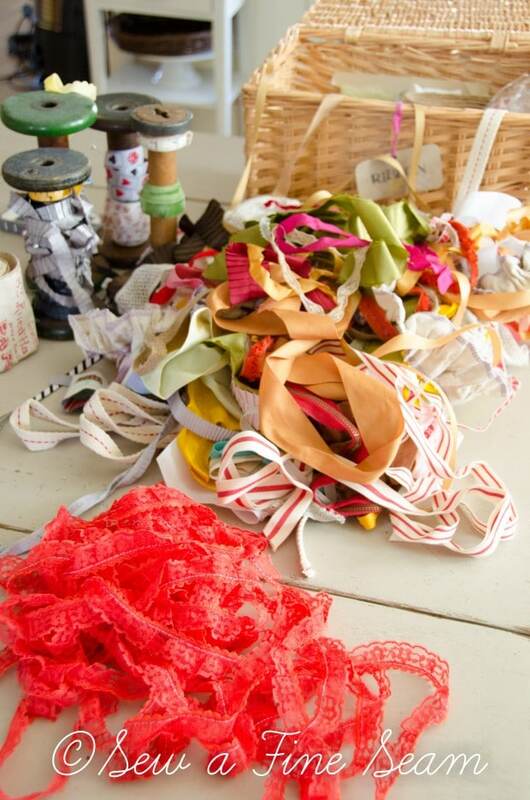 I use it in lots of sewing projects, to tie around gifts, to dress up a centerpiece on a table, as part of a vignette, the possibilities for ribbon are endless. As a friend once told me – you can never go wrong with ribbon. 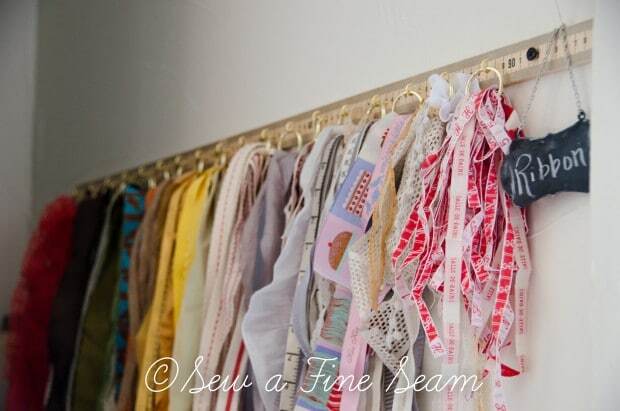 And with lots of ribbon you need a DIY Ribbon Organizer. As Spring approaches it always makes me dig in and clear things out and re-organize. I get rid of a lot of things I’m sure I’m not going to use. But ribbon is one thing I almost never get rid of. And since I have a lot of ribbon, and an insatiable love for beautiful ribbon, I needed a Ribbon Organizer. 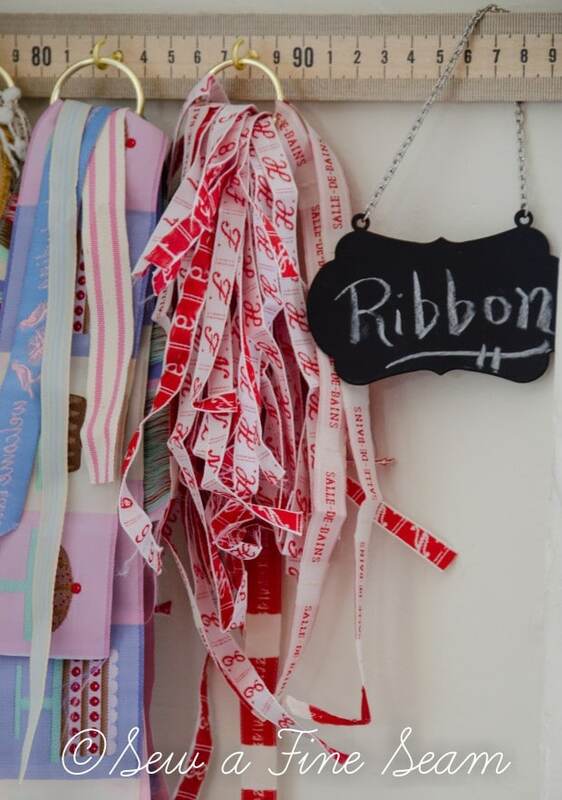 A DIY Ribbon Organizer that is cute and fun and cheap and functional and makes me feel so feel so happy every time I look at it – because I created it all on my own! Over the weekend I finally took time to look through the newest issue of Country Living. 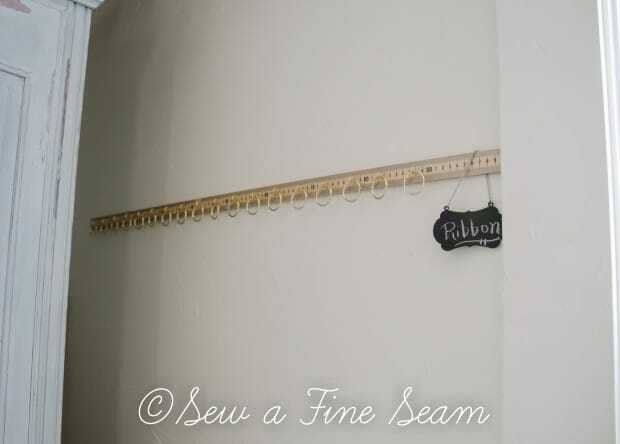 I took a second look at this ribbon organizer they featured and then promptly bookmarked the page to show to my hubby. This hodge-podge tangle of ribbon has been stuffed in this basket for a couple of years. Every time I want to use ribbon I dig and tug my way through this mess to see what I even have on hand. A few of my more recent ribbon purchases did get wound on old wooden spools like the one you see beside the basket. But the overall scenario was less than nice to look at and even less efficient. Another great thing you can do with a stash of tangled ribbon – create a Ribbon Easter Purse. Directions for making one are in the March/April edition of Celebrating Everyday Life with Jennifer Carroll and it can be purchased here. I knew when the work week ended last week that the first thing on the agenda this week would be to reorganize and regroup a bit in my work room. After finishing up an event deadline last week, the room was a bit chaotic and in need of some TLC and pampering. And the ribbon organizer kept nagging in the back of my mind. 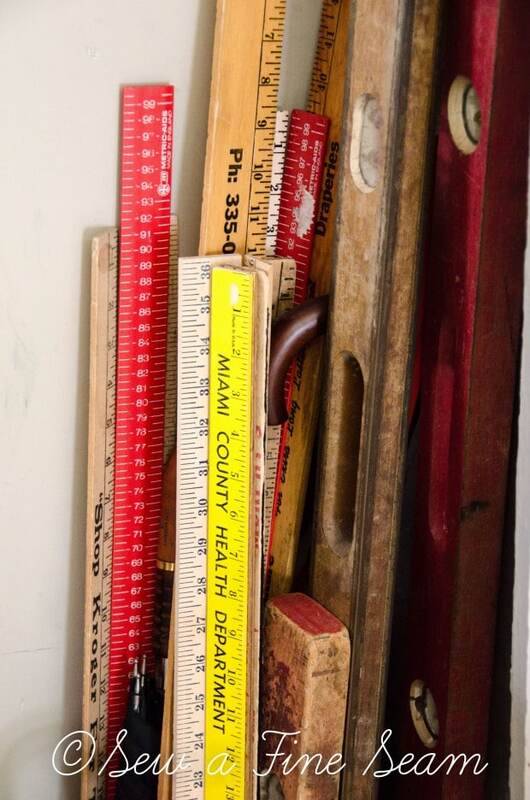 The yard stick needed to create this wasn’t a problem – I have plenty of old yard sticks. When my girls started begging me to run to Dollar General and get some Kraft mac-n-cheese I obliged and stopped by the local hardware store too. They had the screw-in hooks I needed and some eye screws but no wood rings. I wanted this project done NOW and I wanted to do it myself. 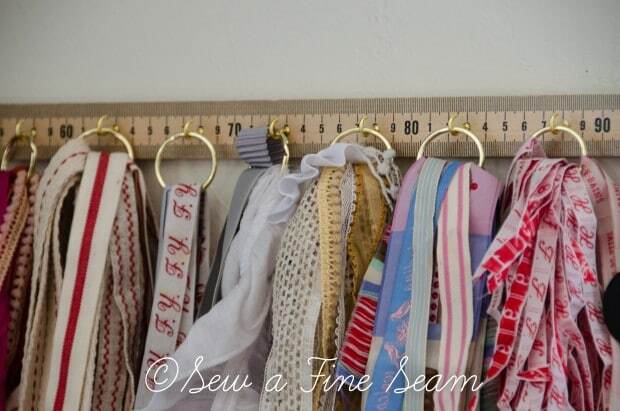 No waiting around on hubby to do this one for me – I can use the big tools too 😀 So what did I have on hand that would work for my DIY ribbon organizer?? Key rings! I have a huge stash of key rings that I wholesaled so I could make key chains out of my scraps of fun fabric and not have to run to town every little bit to stock up on more key rings. They would certainly do as a stand in for the rings used on the organizer featured in the magazine. 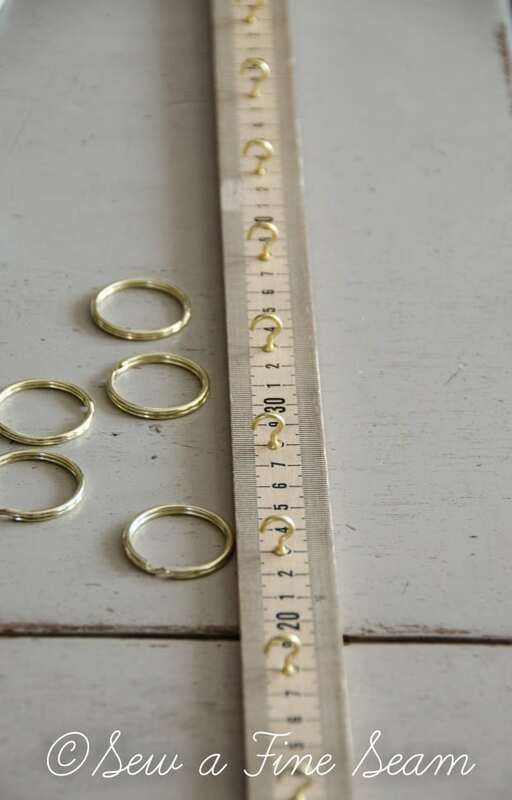 And I had brass key rings that would match the brass hooks I found. I spaced my hooks so the rings wouldn’t touch when they were hanging. 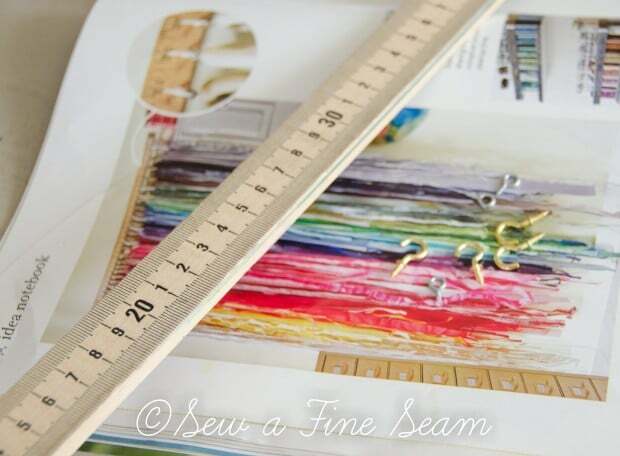 Using a yard stick makes it super easy and fast to get the hooks spaced evenly – I used the back side of my yard stick that is printed in centimeters instead of inches simply because I liked the look better. 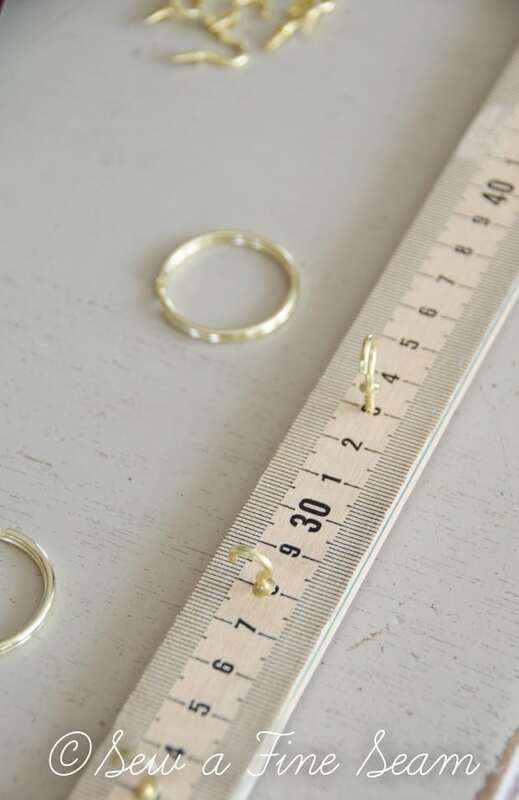 The wood of the yard stick is soft enough the hooks screwed in by hand without drilling first. The point of the screw just barely popped through the back side but since it will be hanging on the wall that isn’t an issue. I tried command strips that I found at Dollar General and they worked for a bit but I was pretty sure they weren’t going to work long-term. My wall space is limited and this goes back in beside my fabric storage cupboard but it works just fine. You can see that I could have used a couple more hooks to completely fill my yard stick. I bought 3 packs of hooks for a total of 18 hooks. I decided it wasn’t worth another trip to the hardware store and just added this fun chalkboard tag to the end to fill the extra space. A friend just sent me a wonderful package of goodies and this tag was part of it. 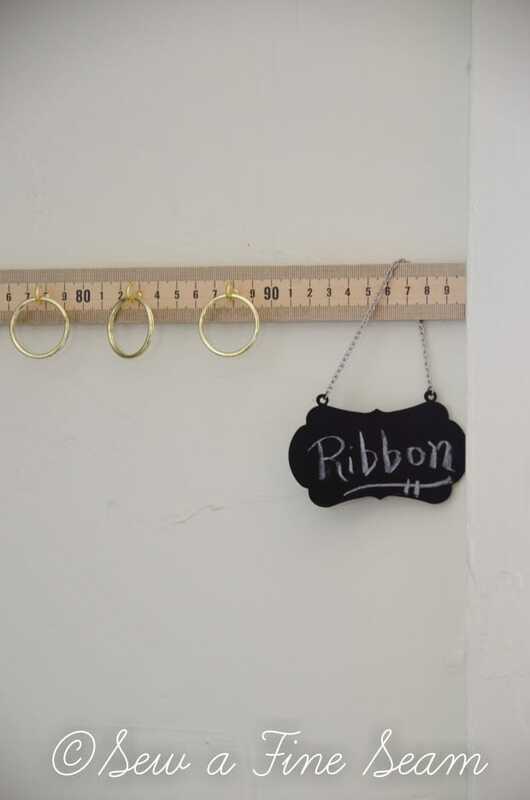 After getting the hooks in the yard stick and the yard stick on the wall it was time to de-tangle my ribbon stash and get it on those rings. It took less than half an hour to get all these ribbons neatly organized and in their new home. See that screw in the yard stick on the far right? 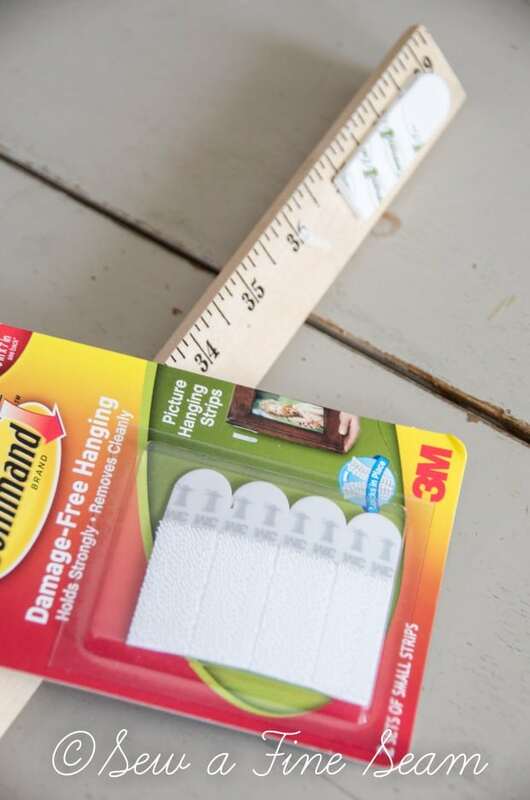 I decided the command strips weren’t going to hold up long-term – but was I going to give up or wait for my hubby to find a solution? OF COURSE NOT! I’ve been so inspired by Donna of Funky Junk Interiors and all her big tools and all the big projects she does herself. There was no way I was gonna NOT finish this simple little project on my own. I have my own electric drill/screwdriver that my hubby gave me for Christmas years ago. It’s small but it will do almost any job I’ve put to it so far. I found some screws and this Ribbon Organizer was soon so tight to the wall it ain’t goin’ nowhere. Yes I’m a bit proud of myself. No I did not measure or use a level. Yes, I just eyeballed it. Yes, it looks straight to me and everything is hanging nicely. No, you may not put a level on it to see if it is indeed level. Yes, you might want to follow along with me and see what other projects I just might tackle all by myself this year! I hope you enjoyed seeing how I made this DIY Ribbon Organizer – and if you have as much ribbon as I do I hope you make one for yourself too! Thanks so much Debbie! I’m really liking it! Sounds like me Laura – I have to just sit down and look at magazines instead of waiting till I have time. It looks like artwork with all your beautiful ribbon, Jill! Very clever!! Such a great idea! I have a lot of left over ribbon that I stash in drawers. Not the best method. That looks so cute and I love how easy it will be to find what you need now. Thanks Kelly! Can’t wait to see yours if you do this too! love it.. very good idea! I’m thinking your metal rings will just stay.. looks good to me! 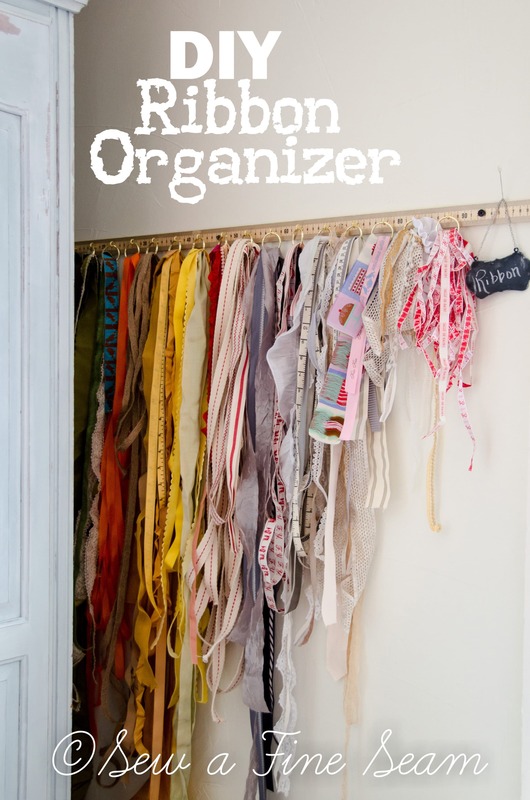 Love love love organizer ideas… guarantee that one is gonna hit pinterest =) And yeah for spring.. it’s coming!! I’m sure you are right – I’ll never get around to changing this up – unless of course I needed the key rings to use for what they were actually intended for! I want one for my birthday! I’m thinking it would look terribly cute in my guest room and I keep my ribbon in there in the closet. Will have to go eyeball my wall space. 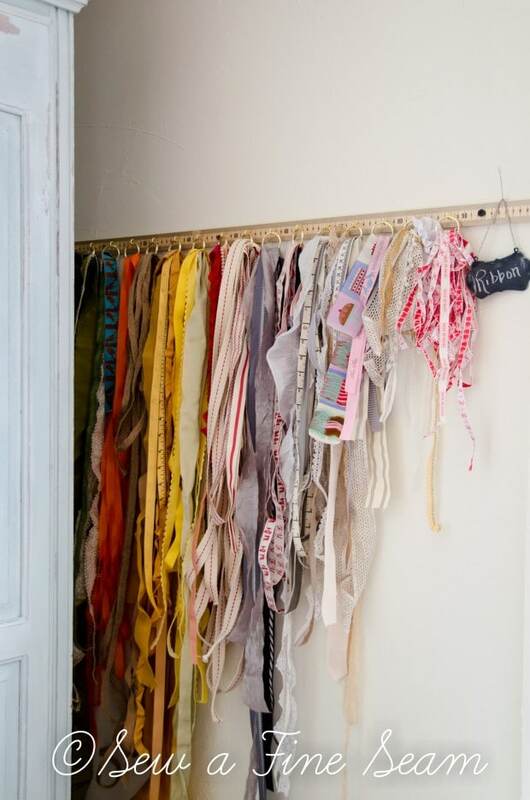 But it would look so cute with my hanger full of scarves! It would be really cute in there! you could make that room double as a guest room and a craft room! I have plenty of yard sticks if you want me to make you one! I ripped out that page from my Country Living magazine too – such a cool idea! Yours turned out so well I may have to try it too. I think I’d use my stash of ribbons more if it was out where I see them all! 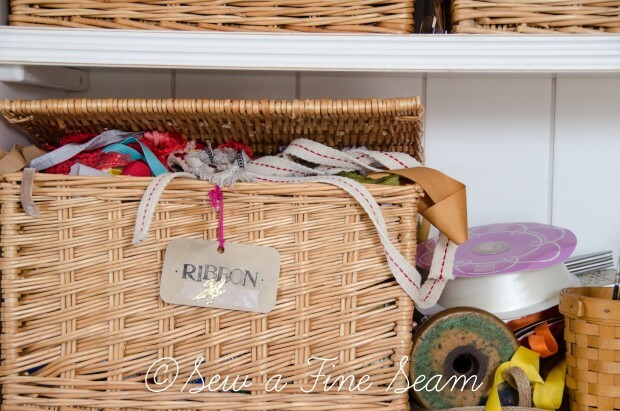 Great idea to copy Kris – it was so easy and I love having my ribbon where I can see what I have on hand! Thanks Sonya! I am really loving it! Super cute! And FYI, command strips are amazing! They’ve been holding a bunch of things for me for a long time! I LOVE this! Such a good solution, and it looks so pretty up on the wall too! You, my friend, are a ribbon hoarder! Thanks for sharing at Fridays Unfolded! LOL! Yes, I would have to agree that ‘ribbon hoarder’ is one of my titles! I use it a lot for projects so it’s always nice to have it on hand right?!! This is such a cute idea, Jill! I don’t have that much ribbon, but I would definitely use this idea if or when I do accumulate more! Gorgeous! Oh my goodness I love the little hooks! So pretty! Thank you so much! I am rather happy with this project! Question — I am confused how the ribbon just stays up as you took it off the spool.. does it fall down when ribbon becomes short?